My hubby and I had a lot of fun making these! 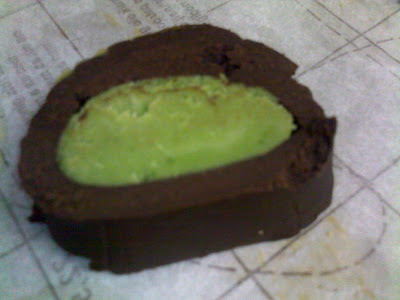 Figuring out how to roll the chocolate dough around the matcha dough without it breaking or sticking too much was a fun challenge :-) The end result was cute to look at and deliciously buttery to eat. Should you try this recipe, I hope you'll get as much enjoyment from making them as we did! Beat butter and agave syrup together. 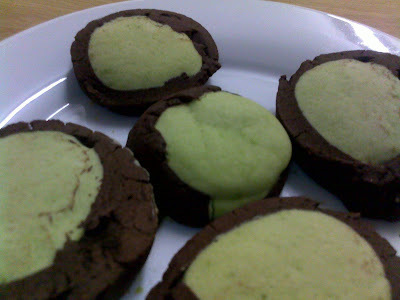 Add the vanilla, flour and matcha powder; using the dough hooks on an electric mixer to mix till just incorporated (i.e. the dough sticks together). Use your hands and some cling wrap to roll the dough lightly into long, thick "worms"; forming the inside of the dinosaur egg. 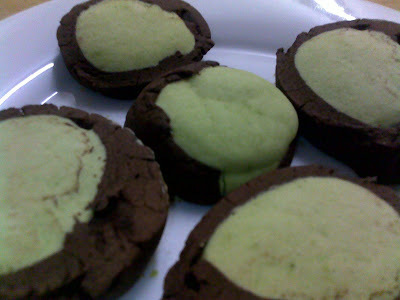 Refrigerate again till the chocolate dough is ready. Add the cocoa powder and flour; using the dough hooks on an electric mixer to mix till just incorporated (i.e. the dough sticks together). 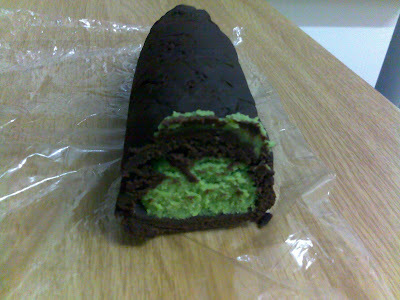 Roll the dough out between two pieces of baking paper till it is just long/wide enough to be shaped and closed around the green matcha dough "worms". Wrap in cling wrap tightly to "round-off' the shape, and refrigerate for another hour. Slice off 1.5 cm pieces of the finished dough "worms", laying them out on a baking sheet lined with baking paper. Bake for 15 - 16 mins at 175 - 180 degree celsius on the middle rung of the oven. Looks yummy! Where did you find the matcha? Hi Marisa - you've got mail! I can imagine how much fun my kids would have making these, lovely.